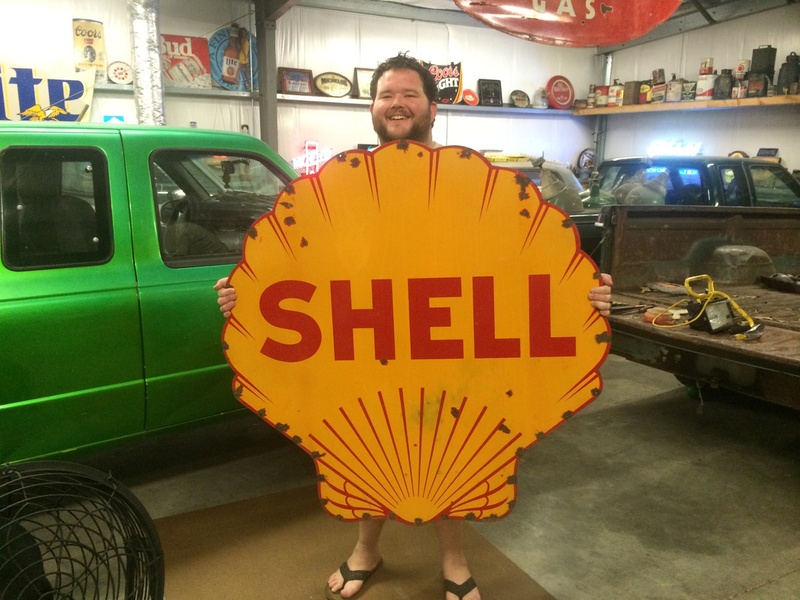 In Signs > Gas, Oil, and Service Signs > Show & Tell. I got this from one of my honey holes, when I first saw it two and a half years ago it wasn't for sale. Called the owner yesterday and just brought it up like I have time and time again and this time he said yes. I'm so happy I got it in my collection. Picked it up from him today he met me at his building and made a special trip for me because he is only open on Wednesdays. The last two pics are the way I got it and the first two pics after deep cleaning. Nice pick! Is it porcelain or painted? Any bullet holes? Thanks for the love Welzebub. Thanks for the love and nice comment kanukster. It's porcelain and no bullet holes. Congratulations. You look sooo happy to finally have it. Thank you for the love and nice comment Aimathena. Thank you for the love officialfuel. Thank you for the love fortapache. Thank you for the love Chevelleman69. Thank you for the love mtg75. Thank you for the love trukn20. Thank you for the love racer4four. Thank you for the love vetraio50. Thank you for the love Longings. Thank you for the love EJW-54. Thank you for the love shughs. Thank you for the love leighannrn. Persistence paid off HUGE, right there!!! Thanks for the love sugargirl. Thanks for the love AntigueToys. Thanks for the love and nice comment tommy1002.. I still can't believe he said yes!!!! Thank you for the love egreeley1976. Thanks for the love vanskyock24. Thanks for the love PhilDavidAlexanderMorris. Thank you for the love antiquerose. Thank you for the love packrat-place. Thank you for the love toenail2. Thank you for the love sanhardin. Thank you for the love SEAN68. Thanks for the love valentino97. Thanks for the love Designer. Thank you for the love Beachbum58. Thank you for the love crswerner. Thank you for the love chevy59. Thank you for the love geo26e. Thanks for the love jameyrd. Thanks for the love pw-collector. Thanks for the love chrissylovescats. Thank you for the love gargoylecollector. Thank you for the love pickrknows. Thank you for the love TheSimpleBarn. Thank you for hitting the love button again antiquerose. Thank you for the love Belltown. Thank you for the love ho2cultcha. 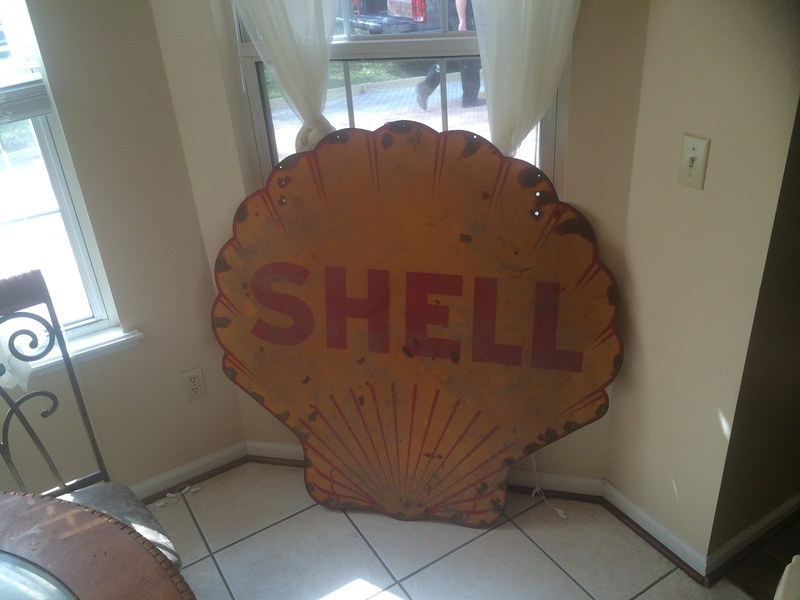 I just love those Shell colors! Thank you for the love and comment DaveSierra, I have been wanting one of these for quite a while. Thank you for the love lisa. Thank you for the love and nice comment Roycroftbooksfromme1. Thank you for the love kyratango. Thanks you for the love inky. Thank you for the comment inky, I still am in shock that he said yes. This photo just went viral, posted on Mike Wolf American Picker site just like I always do only this time he left me a comment and 1 hour later 131 likes wow how neat. Thanks for the love pops52. And by the way the first picture w/your head and your flip-flop feet - PRICELESS. 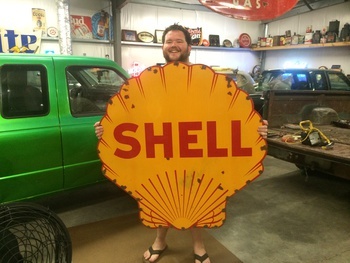 Very handsome man holding the shell Trey! Yeah Mike at AP should give a comment. Thank you for the nice comment valentino97. 281 loves on Mike Wolf's Facebook page in less than 48hrs, plus all 50 loves on here this is so AMAZING thanks again everyone for hitting the love button GREATLY APPRECIATED!!!!! Thank you Trey. Thank you for the love petey. Thank you for the love Budek. 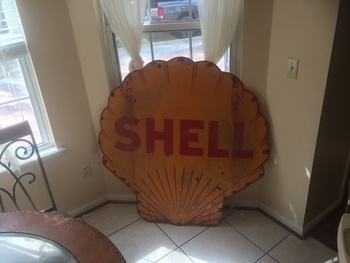 Does the Shell sign have a 1929 date on it? If not it is from the 30's era. It doesn't have a date on it. Thank you for the love artdecogirl. Thanks for the love Rattletrap. Thank you for the love Jewels. Thanks for hiting the love button again pickrknows. I think that all of us serious collectors who don't make a buz of collection ought to know who each other are so we don't have to go through places like Ebay to increase our collections? I can be reached at Kauairooster@gmail.com if you have stuff to trade. 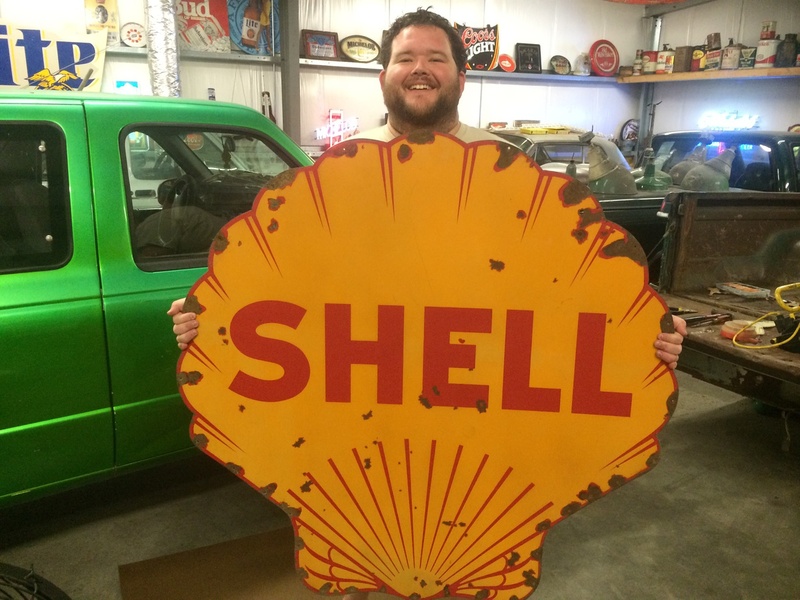 We don't sell but we do get extras of cool signs to trade to other collectors for stuff we don't have. Thank you for the love CindB. Thanks for the love trunkman. Thanks for the love luckywest. Thanks for all the loves Merry Christmas!!!! Thanks for the love Hedgewalker. 58 loves wow thanks everyone!!! Thanks for the love and comment CindB:) hope you are well and have a treasure filled day!! Thanks for the love Prells6. Trey you just got so much cool s**t!! LOVE IT!! Thanks for the love and nice comment Digitali5:) that sign is the end result of a grown man begging for over 2 years LOL. Thanks for hitting the love button again kyratango:) and the nice comment as well. For the Sign ................ AND for your Happy Big Beaming Smile in your Pics !!! Thanks for the love Belgianvintagefan. Thanks for the love Signaholic. Wow! What an awesome find!!! I love it! You are more than lucky! Thanks for the love Stammy. Thanks for all the loves!!! Thanks for the love katherinescollection. Thanks for the love FirstBuzz. Thanks for hitting the love button again kyratango:) you are definitely my biggest supporter on this post!!! And your happy guy smile!!! Thanks for all your kind comments:) greatly appreciated!!!!! Thanks for the love kaputs11 and the nice comment:) I really do enjoy collecting and sharing my finds. Thanks for the love and nice comment Rattletrap:) it's the rush I get when I find a great sign out in the wild and I seal the deal!! Well put Rattletrap I am like Jacques Cousteau :) instead of exploring the sea I explore the land in search of New and Interesting things, taking down notes and getting names and numbers for that next big adventure:) And just like Jacques the thrill is on the hunt !!! Trey cool sign & collection! Your smile gets bigger every time i look at this photo have a great weekend Trey. Thanks for the love Ted_Straub. Thanks for hitting the love button again ho2cultcha. Thanks for the love charmsomeone. Are you in lack of loves Trey? Thanks for the love Bobbyhole. Thanks for the love garrybeair. Love it again Trey? Did something happen to your pic here? Just say your own last post? ~ LOL.....with these Big Signs, one wonder what your wearing behind it...LOL. My friend said it looked like you were naked hiding behind the Sign. I KNOW THAT IS NOT TRUE -- but funny how some people see things differently . Glad my pic is back!!! Thanks for the love Nicefice. Thanks for hitting the love button again Bobbyhole:) much appreciated !! I still kove this Shell sign! It's a beauty! Thanks for hitting the love button again Rattletrap:) and the nice comment. Awesome sign! Unfortunately I don't have the space for large format of these signs. Thanks for the love Brunswick. This is very cool! Are you still beaming??? lol so cute! Thanks for the love shareurpassion:) and your nice comment. You know I am!!! Thanks for the like AmatoorPikr. Love your meen green ride!!! Thanks for the love AmatoorPikr. Thanks for the love Alchemy1949. Thanks for hitting the love button again Thomas:) Hope you have a fantastic day as well!! Thanks for hitting the love button Destiny.Jennifer.g.! Thanks for hitting the love button Windwalker ! 2u again Trey -- Love, Love, love all your Rusty Gold!! You have a museum I would like to see also !!! Thanks for the love Efesgirl. Hope NO Sink holes by you and your collectibles!! Ravage60 thanks for the love. Thanks for the love abrams87. Thanks for the love Oroyoroyisthatyourhorse. Thanks for the love Celiene. Haha, Trey, still love your smile and.... the fact the shell seems to be your only garment! Thanks for the like mtg75. Thanks for the love Virginia.vintage. Thanks for the love roddyq. You're just like an old Penny, you just keep showing up over and over again! Thanks for the love kyratango. Thanks for the love cindyjune. Thanks for the love antiquerose. I love it so much I have to hit the love it button once in a while LOL !!! There ya go Trey. Sorry i forgot when you first posted it! Excellent Find!!!!! Thanks for the love frisco. Thanks for the nice comment Izenglish. Thanks for the love elanski. Thanks for the love Izenglish. Thanks for the love Johnsmith. Thanks for the love Newfld. Thanks for the like Beachbum58. Thanks for the like crswerner. Thanks for the love kyratango!!! Merry Christmas !!! Merry Christmas mrcolorz and thank you for the love. Thanks for the like Designer. Thank you for the like chrissylovescats. Thanks for the like Longings. Thanks for the like AntigueToys. Thanks for the like sanhardin. Thanks for the love Anik. Thanks for the like shughs. Thanks for the love nutsabotas6. Thanks for the like Chevelleman69. Came to see if the colour matches my Weiss brooch - and it does! I also like your green truck - I think the colour change was a great choice! LOL DanteDreaming:) He does have a bunch of stuff !! Thanks for the love VintageMisc. Thanks for the love iggy. Thanks for the love TassieDevil. Thanks for the love vetraio50. Thanks for the like Moonhill. Thanks for the like leighannrn. Thanks for the like sugargirl. Thanks for the love buckethead. Thanks for the love Sean. Thank you for the love Moonhill.